Standard costing is an important subtopic of cost accounting. Standard costs are usually associated with a manufacturing company's costs of direct material, direct labor, and manufacturing overhead. Rather than assigning the actual costs of direct material, direct labor, and manufacturing overhead to a product, many manufacturers assign the expected or standard cost. This means that a manufacturer's inventories and cost of goods sold will begin with amounts reflecting the standard costs, not the actual costs, of a product. Manufacturers, of course, still have to pay the actual costs. As a result there are almost always differences between the actual costs and the standard costs, and those differences are known as variances. If actual costs are greater than standard costs the variance is unfavorable. An unfavorable variance tells management that if everything else stays constant the company's actual profit will be less than planned. If actual costs are less than standard costs the variance is favorable. A favorable variance tells management that if everything else stays constant the actual profit will likely exceed the planned profit. Since the calculation of variances can be difficult, we developed several business forms (for PRO members) to help you get started and to understand what the variances tell us. 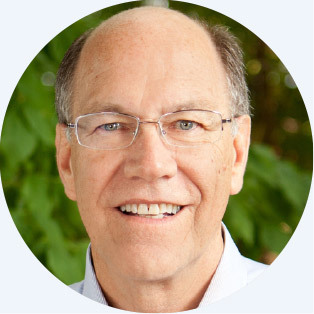 Learn more about AccountingCoach PRO. New! We just released our 29-page Managerial & Cost Accounting Insights. This PDF document is designed to deepen your understanding of topics such as product costing, overhead cost allocations, estimating cost behavior, costs for decision making, and more. 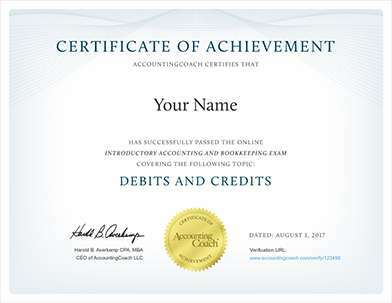 It is only available when you join AccountingCoach PRO. The aprons are easy to produce, and no apron is ever left unfinished at the end of any given day. This means that your company never has work-in-process inventory. Direct materials refers to just that—raw materials that are directly traceable into a product. In your apron business the direct material is the denim. (In a food manufacturer's business the direct materials are the ingredients such as flour and sugar; in an automobile assembly plant, the direct materials are the cars' component parts). DenimWorks purchases its denim from a local supplier with terms of net 30 days, FOB destination. This means that title to the denim passes from the supplier to DenimWorks when DenimWorks receives the material. 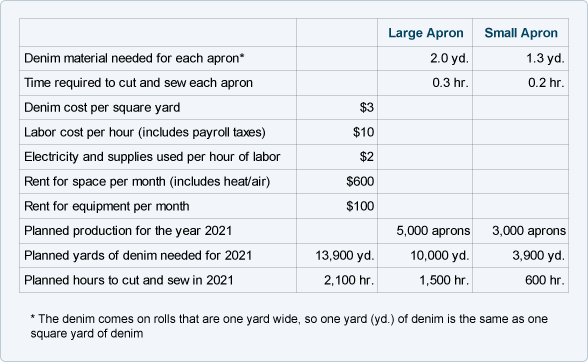 When the denim arrives, DenimWorks will record the denim received in its Direct Materials Inventory at the standard cost of $3 per yard (see standards table above) and will record the liability at the actual cost for the amount received. Any difference between the standard cost of the material and the actual cost of the material received is recorded as a purchase price variance. The $100 credit to the price variance account communicates immediately (when the denim arrives) that the company is experiencing actual costs that are more favorable than the planned, standard cost. After the March 1 transaction is posted, the Direct Materials Price Variance account shows a debit balance of $50 (the $100 credit on January 2 combined with the $150 debit on March 1). A debit balance in a variance account is always unfavorable—it shows that the total of actual costs is higher than the total of the expected standard costs. In other words, your company's profit will be $50 less than planned unless you take some action. Direct Materials Inventory is debited for the standard cost of $9,000 (3,000 yards at $3 per yard), Accounts Payable is credited for the actual amount owed, and the difference of $240 is credited to Direct Materials Price Variance. A credit to the variance account indicates that the actual cost is less than the standard cost. After this transaction is recorded, the Direct Materials Price Variance account shows an overall credit balance of $190. A credit balance in a variance account is always favorable. In other words, your company's profit will be $190 greater than planned due to the favorable cost of direct materials. Note that the entire price variance pertaining to all of the direct materials received was recorded immediately. In other words, the price variance associated with the direct materials received was not delayed until the materials were used. We will discuss later how to handle the balances in the variance accounts under the heading "What To Do With Variance Amounts".